When Leicester City won the league in 2016 under Claudio Ranieri, it was a special moment in the history of the club and English football. The Foxes went against all odds to emerge champions in a league that was widely dominated by a select few clubs with superior resources. Malcolm Gladwell wrote a book titled Outliers: The Story of Success. He examined people and groups who approached problems from a unique perspective, applying innovative solutions that worked. In a sense, Leicester were outliers for a brief shining moment. Dealing with the aftermath has been difficult. Two things happen when an innovative solution proves effective. Other people either copy the method or steal the components. Cavemen stole fire and the wheel from other tribes until they figured out how to make both themselves. Bigger Premier League teams emulated Claudio Ranieri's counterattacking schemes. Chelsea signed the player at the heart of the Foxes' success, N'Golo Kante, winning the next season's title with the effervescent defensive midfielder at the heart of their lineup. Arsenal attempted to sign speedy striker Jamie Vardy. When they failed, they pursued similar targets until they landed Pierre-Emerick Aubameyang. Manchester City harried Leicester for creative winger Riyad Mahrez. They didn't give up, turned the player's head and eventually landed him. Another change occurs when outliers reveal themselves. Out of respect, people treat them differently. We all value experience and knowledge. When a team breaks through to win its first title, the next often comes easier. When opponents take the pitch against Leicester, they're aware they're playing former champions. Their focus is greater. That makes it more difficult, not easier for Leicester to repeat their success. At the same time, the taste of success lingers on the tongues of supporters. They want more. They expect their side to perform at the same level despite losing key players. When they don't, they clamour for the manager to go. When he does and the next also fails, they clamour for him to go. On their third manager since hoisting the Premier League trophy, hope lingers that the magic can be rekindled even though fans helped to break the spell in their impatience. The board that sacked Claudio Ranieri and Craig Shakespeare cannot be faulted for trying hover next to the sun. Success is addictive, always leaving the successful craving more. The same holds true for fans. The problem is the club has fewer resources than top six clubs. Before his untimely death, Vichai Srivaddhanaprabha was a wealthy man, just not in the same class as Sheikh Mansour at Manchester City, Walmart inlaw Stan Kroenke at Arsenal, Manchester United and Liverpool's American financiers or even Roman Abramovich at Chelsea. The Thai billionaire resembled Abramovich most closely. He had a vision and the will to make it a reality even if it proved unsustainable. 100 days on. 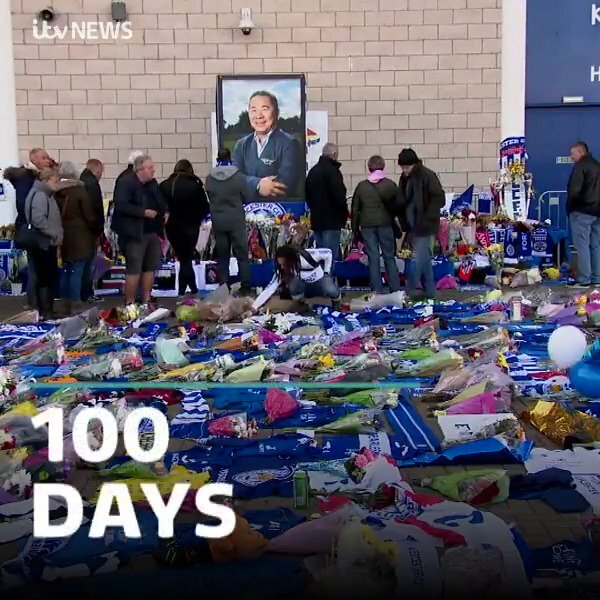 This is how a club and a community have come together, after the horror of the #Leicester helicopter crash. "We'll never get another chairman like we've had." Without Vichai to keep dreaming and searching for another innovation, Leicester are in a difficult position. They have shown clubs with deeper pockets a better way. The advantage is lost and so is the innovator. Without the same resources as the top-six, the Foxes must compete for the ignominious title of 'best of the rest'. In time, the title run will be a distant memory. That distance will make their fate easier to accept. For now, their continued fight is fascinating. Everyone, their fans, the opponents' and the neutral observer all hold their breath waiting to see whether Leicester can recapture their moment, even for an instant. Can they be an outlier again just for a little while? 31-year-old Lover of all things soccer, a loyal fan of Manchester United.